We take pride in providing our community with high quality service at an affordable price. Pest infestations in your home or business can be a stressful and uncomfortable experience. With our team of efficient and respectful employees, our goal is to get your life back to normal. We are cost efficient, environmentally conscious, and incredibly determined to eliminate your pest problem once and for all. Bed Bugs are on the rise in California. These pests don’t take a day off and neither should you. Give us a call today or click the link below to request service! Roach infestations are a health risk, especially for children and the elderly. Let us help keep your family/customers safe. Give us a call today or click the link below to request service! Rats and Mice destroy your property causing major electrical, structural, and plumbing damage to your home/business. Call today or click the link below to request service! Spiders may help keep other pests in your home or business to a minimum, but can often be more dangerous than their prey. Most venomous Spiders are nocturnal and are very good at hiding where you’d least expect. Fleas may be wingless, but since they can jump up to 6 feet in the blink of an eye, it's almost like they can fly. They love to hitch a ride on pets like cats and dogs, but can also travel via clothes and shoes. 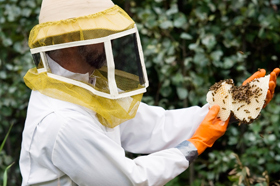 Bees are territorial insects and although many species are relatively harmless, others can be dangerous for your family/customers. If they decide your home or business is now theirs, give us a call and we'll make sure your family/customers can feel safe again. The sting of a wasp is painful to say the least, but the real issue is their aggressive behavior and how quickly they can multiply. This can be a real problem for families and business owners. Let us fight back for you and make your home/business wasp-free! We also provide effective and affordable treatment for flies, mites, earwigs, silverfish, mosquitos, ticks, beetles, moths, and more! Give us a call today if you have any sort of pest issue in your home and business and we can help you rid yourself of this problem once and for all! If you're in need of regular pest control services, you're in luck! UnBugMe Pest Control offers bimonthly services for homes and businesses with 50% off the initial treatment when you sign up for a year. We take pride in providing our community with high quality service at an affordable price. Has an animal made a home in your house, yard, or business? We specialize in humane animal trapping services for possums, raccoons, squirrels, skunks, pigeons, feral cats, and more. You can feel good knowing your home is yours again with no harm to the animal. We also can remove dead animals from your property, sanitize the area, and safely dispose of them. LA's Sanitation Department can take days to respond to your call. We'll come to you the same day and save you the hassle of disposing of the contaminated, germ-ridden animal.